The rachetta pizza at A16 Rockridge. Photo: © tablehopper.com. ~A16 ROCKRIDGE~ is beginning Sunday brunch service on September 8th. From 11am-2pm, look for Southern Italian-inspired brunch dishes, including sfogliatelle (can’t wait to try this, it’s the pastry I miss most in Italy), zeppole donuts with strawberry jam, a changing frittata of the day, and fried ceci beans and potatoes with slow-cooked egg. 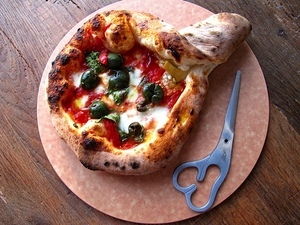 There will also be options from the pizza oven, including their rachetta, all with the option of adding an egg. Of course espresso beverages will be available, along with boozy selections including a Bloody Mary, amari, and aperitivi. From 2pm-5pm on Sundays, the bar will remain open for drinks and bites until dinner service too. Starting Saturday September 7th, ~CHAMBERS~ will begin offering a Saturday “recovery brunch” from 10:30am-2:30pm. Bottomless mimosas are $12 with the purchase of any entrée, and dishes like “hangover hash” will populate the menu (entrée prices range from $10-15). You’ll also find more classic brunch dishes, like egg plates and a burger. 601 Eddy St. at Taylor, 415-829-2316.